It's in the dead of winter. Most places in the country are freezing cold. Ahh, but this is the Arizona desert. Can you see yourself luxuriating in the warm afternoon sun and listening to some relaxing music? Picture that, and look where you are right now! Wow, is it nice in the desert or what? Be sure to bring a hat and sunscreen because you can get hot in the sun. Even in the winter. 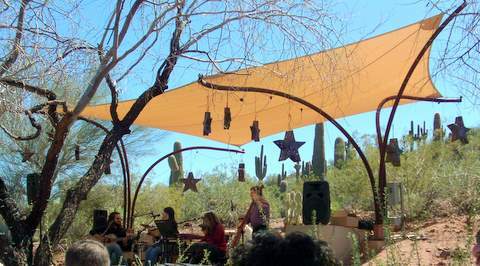 The music attraction we enjoyed was a group called “Banda Tres.” They played in the Desert Botanical Gardens upper level called the Ullman Terrace. The surprise was how good the music was. Not only are the acoustics just right, not too harsh or timid, but the sounds of the group were inspiring. 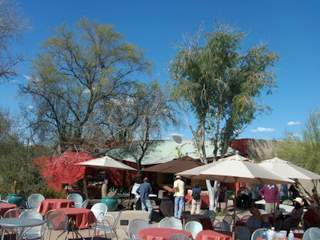 The music sounded like a blend of Brazilian passion flavored upbeat fun jazz that was perfect for the desert garden. Seating is on folding/plastic chairs and you are within a basketball throw of the action! No need for binoculars to see the musicians here. 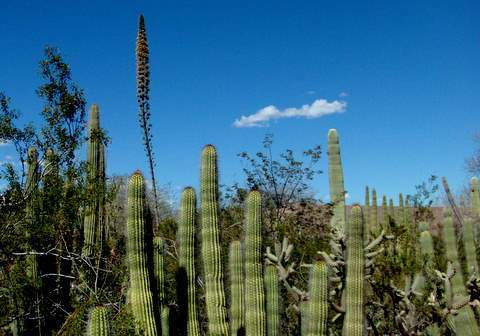 The Ullman Terrace is near the top of the hill via cactus lined trails. Music comes in all forms. Listen carefully and you can hear quail, woodpeckers, and the ever-present finches chime in with the music. You will enjoy the fresh food at the Patio Café and grill station. Take the food right to your folding chair at the beginning or intermission and dine in the outdoors! Makes you feel soooo decadent! Jazz in the Garden Spring Concert Series. And later the Fall Music in the Gardens. It is held in the evenings on Fridays because the desert heat is making the evening air warm and hospitable. 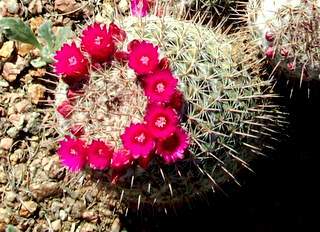 What is NEW at the Desert Botanical Garden? In the fall just before Halloween, take the kids to the Great Pumpkin Festival. They have a hayride to a pumpkin patch. To cap off the year you must try the “Las Noches de las Luminarias.” It is a spectacular must-see holiday happening. Luminarias are Christmas lanterns consisting of candles glowing inside bags. The luminarias are there to guide your walk so you can see the musical groups and find the epicurean food that is available. 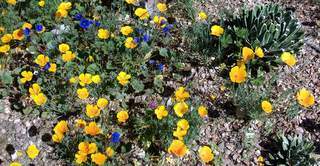 You can see butterflies in the spring and fall months in the desert. That's when the temperature is the best. And the flowers give them nectar to drink. We were looking down at some flowers and brambles next a walkway when there was a fluttering in the shadows. Had to be a butterfly! Here’s the movie we captured. Watch hundreds of them up close! You can go through the Marshall Butterfly Pavilion and see masses of the fluttering creatures in flowers and trees and around a trickling pond. The pavilion is a green tent structure that keeps them in one place. Just before you exit the garden you may want to walk through the gift shop. There are all kinds of books about what you just saw. For example, you will be amazed at how many different types of butterflies live in the desert. 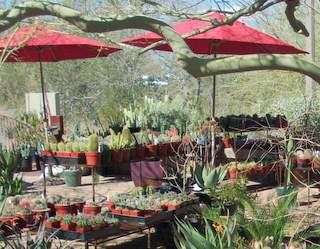 You can also buy unique desert plants and cacti for your own garden. If you come very often a year membership pays for itself. And you will support this privately funded non-profit garden. They are open all year except for a few holidays: July 4th, Thanksgiving, and Christmas. Here is another benefit for members. Did you ever want to go to the Las Noches de las Luminarias, and the tickets were all sold out? Members get advance ticket offers. 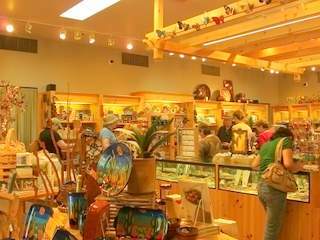 The location is close to the SE Valley and right next the Phoenix Zoo in Papago Park. Parking can be tight so get there early for events. Sometimes there are "special events" in Tempe when the southern entrance to the gardens is closed off. The south entrance is N Mill and Priest. Then you will have to go to the northern entrance via McDowell and the Galvin Parkway (click on the "+" below a few times and you can see).